In this series we'll talk about anything and everything related to scrapbooking (including but not limited to); design, product, tools, and techniques. I would love to feature your questions and comments in this series. Please click the "contact me" button to the right if you have any questions or comments. Lines you ask? Yes, lines. When I create a layout the first thing I think of is where do I want my line of focus and which direction do I want my line to go. 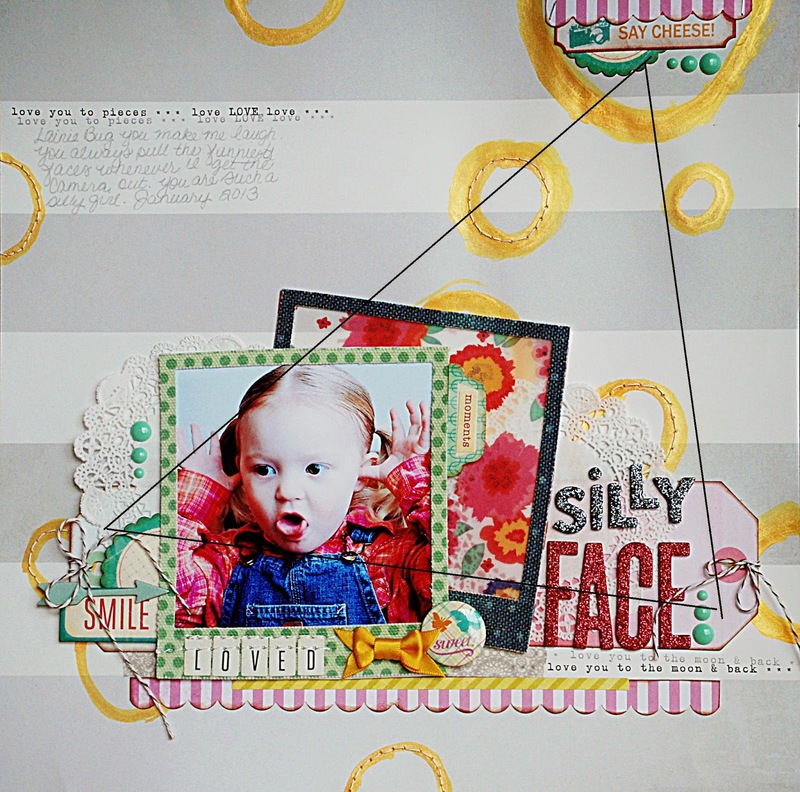 Then I start creating a line with my photos, embellishments, and journaling across that line on my background paper. My goal is to always have a line (or lines) to draw the readers eye across the page. 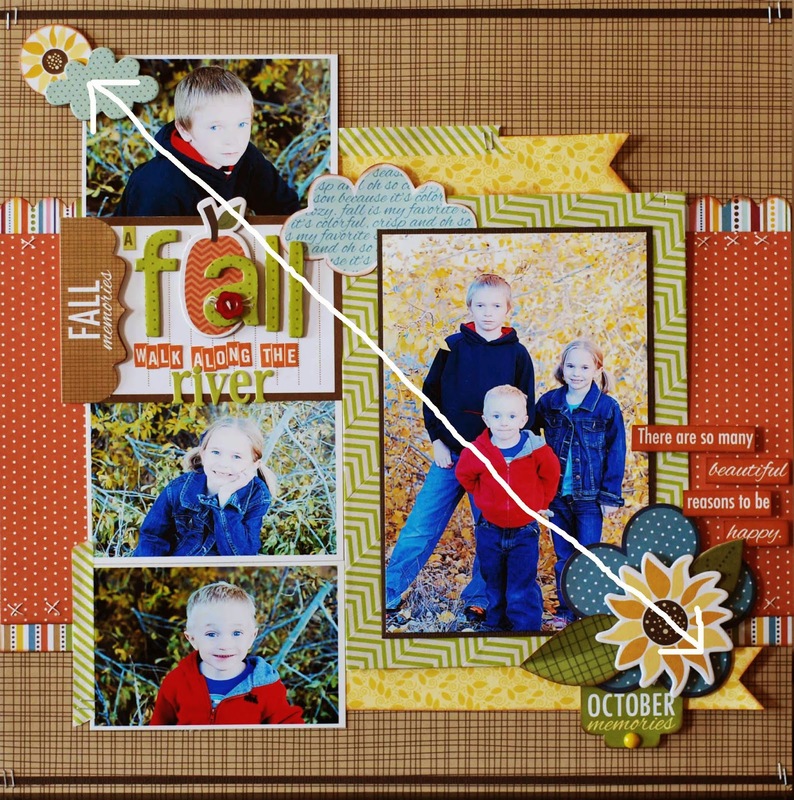 I also try to add the focal point of the layout (usually the photo) directly into the line or very close to the lines. 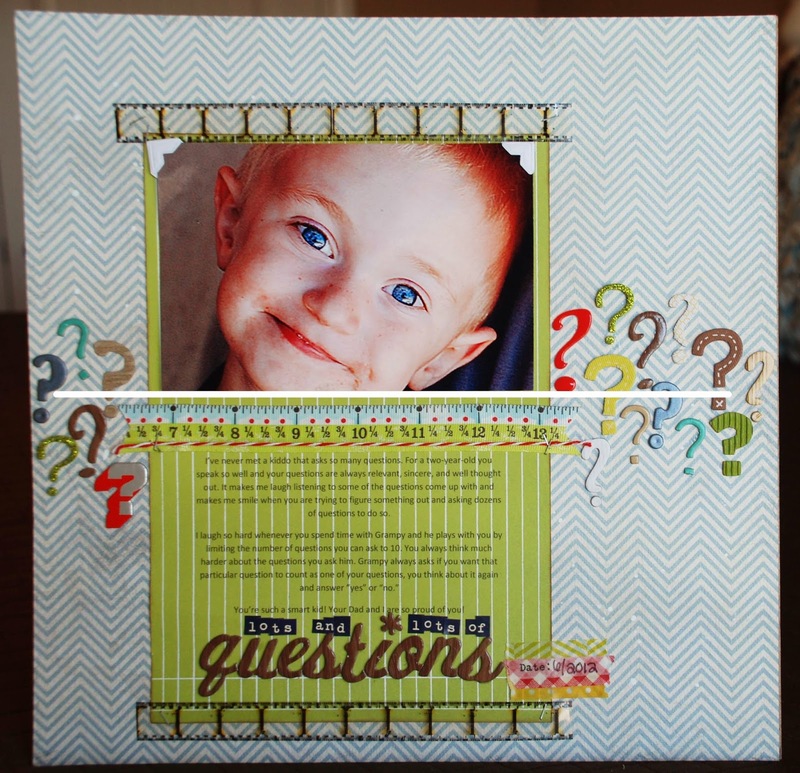 This layout draws the eye across the page with the line of question marks to the right and left of the photo. 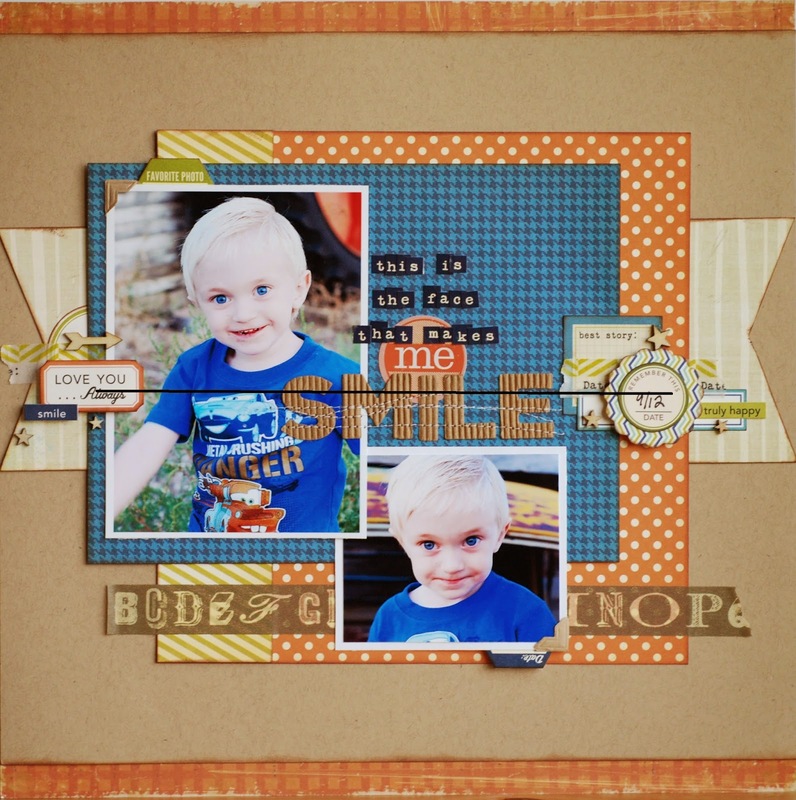 On this layout I wanted both the title and the main photo to be on the horizontal line. 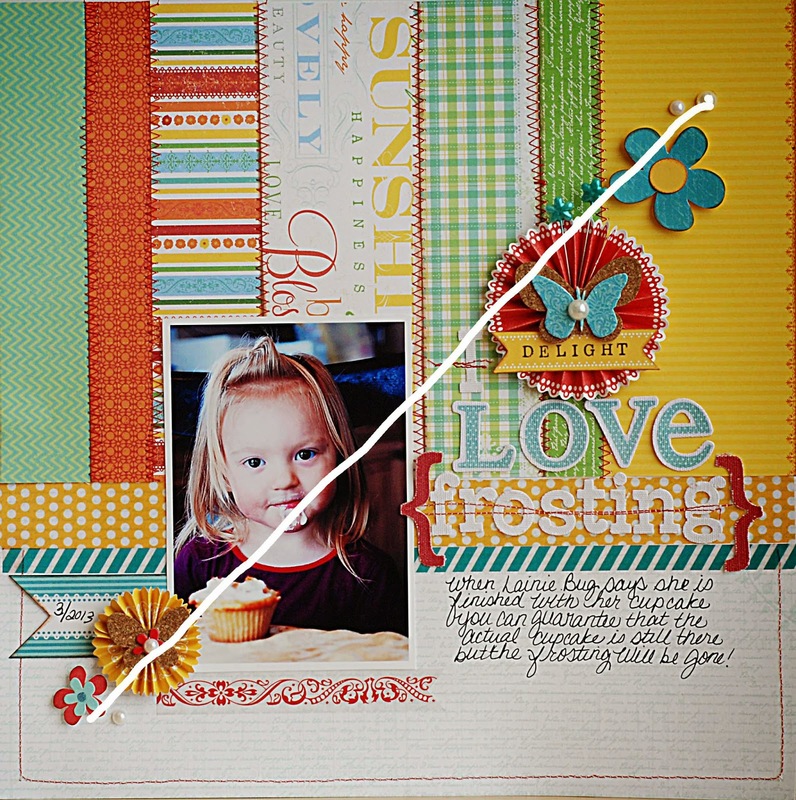 On this one the photo and the main embellishments (the circles and the flower) are on the horizontal line. Next, let's talk about diagonal lines. This is probably my favorite way to design and the way I design most often. 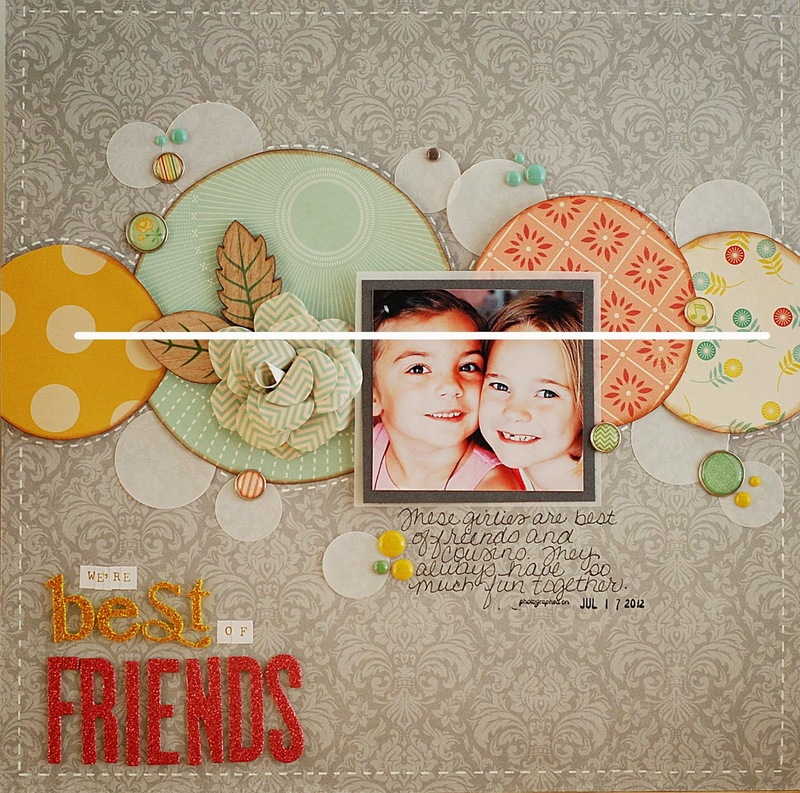 Starting at one corner and working my way to the opposite corner with the focal points of the layouts falling very close or directly on the line. My main photo and title are both on the line. The photo in this one is right on the line with the title falling just under the line. 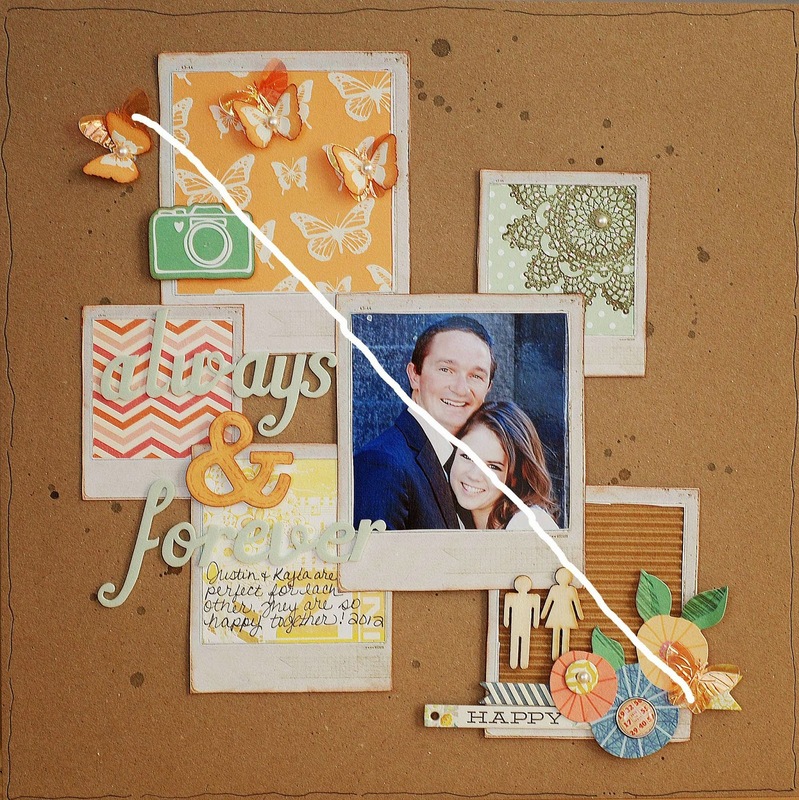 The embellishment clusters draw the eye on the diagonal line. All three major elements of this layout are on the line; the title, the photo, and the title. 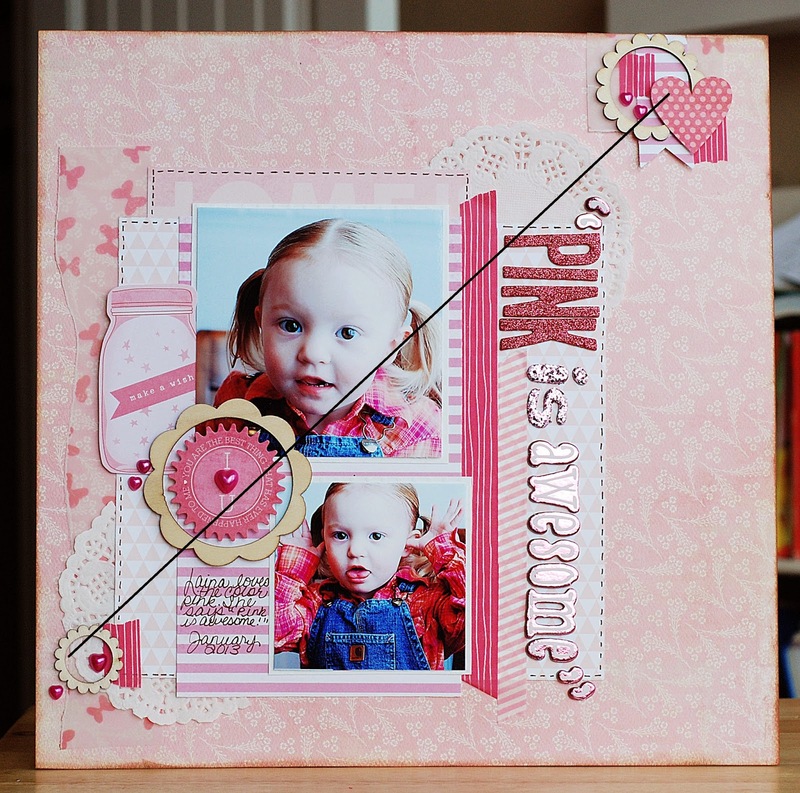 Once again on both of these layouts it's the embellishment clusters that lead the eye across the page. This layout has the title and the photo within the lines. The journaling is outside of the lines but I wrote it with a silver pen so that it didn't distract from the photo and title. I wanted the focus to remain on the silly photo of my niece. I hope you learned a little bit about lines today and how they work. Please let me know if you have any questions or suggestions for "Let's Talk Tuesday" Simply click on the "contact me" button that is to the right and I'll get back to you ASAP! I'm already loving "Let's Talk Tuesday". I can see it's going to be chocked full of valuable information and great inspiration and LINES is a great topic! Very useful and helpful and I like that you are asking for feedback to make it interactive for the reader--it's helps folks like myself to open up and not be afraid to ask "stupid" questions ;) Thank you SO much Becki! I'll be here to check out the chat every Tuesday for sure!! Have a wonderful day! Linsey, Thank you so much for your sweet comment! I appreciate it so much! If you ever have a question I can answer please ask me here in the comments or send me an email. I would be happy to help you out! <3 thanks Lisa! You're so sweet! Thank you for the design tutorial! Love all your examples......you make it look so easy. i had never thought on the diagonal before. So thank you again. Awe, thanks! You're so sweet! Diagonal lines are one of my favorites. i work in a diagonal line often. Great tips!!! Thanks so much for sharing!